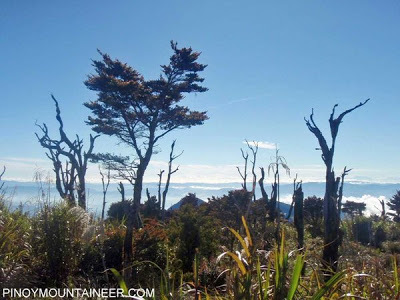 Complementing the grand Kitanglad Range to the southwest is the Kalatungan Mountain Range, which, although smaller, has its own high peaks and perhaps even more challenging climbs. Everest climber Carina Dayondon has described Mt. 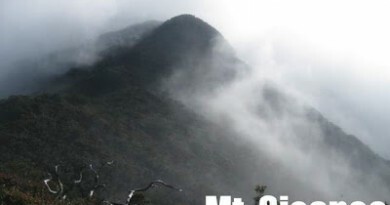 Kalatungan, the chief mountain, as a “difficult climb”. Coupled with the logistic difficulty of climbing Kalatungan, it has grown a reputation as being one of the most difficult climbs in the country. Finally, to complete its credentials, it is now regarded as the 5th highest mountain in the Philippines at 2880 MASL (formerly, we considered it the 6th highest mountain in the Philippines based on a reading of 2824 masl). Kalatungan deserves all its majestic appelations. 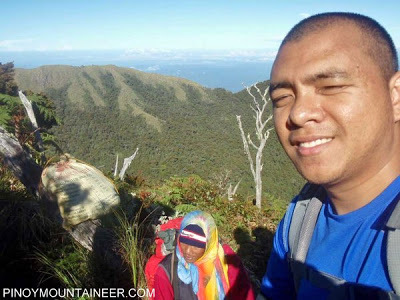 Mijan Pizarro, among the most notable mountaineers in Mindanao, has favorably compared the mossy forest of Kalatungan vis-a-vis those of Dulang-Dulang. And, perhaps the strongest evidence for its biodiversity are the recent sightings of no less than the Philippine eagle (Pithecophaga jefferyi) in its slopes in 2001. Bukidnon legend has it that during the primeval Great Flood, only the Kitanglad peak remained above the waters – and therein grew a stalk of lemon grass (tanglad) hence the name of the mountain. But the Talaandig tribesfolk of Brgy. 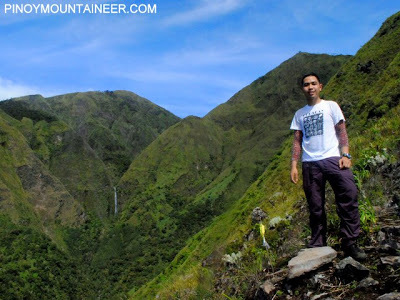 Miarayon [trailhead of the Kalatungan trail] clarifies that in fact, the Kalatungan peak too, stood above sea level. And whereas plant life survived in Kitanglad, animal life took a stand in Kalatungan’s summit, where praying mantis eggs were found. Hence, Kalatungan became the mountain’s name, meaning “praying mantis eggs” in the native tongues. This and more tales are just a part of the cultural component of the trip, and it is always encouraged of climbers to take interest in the tribe’s ceremonies and folkways. Indeed, the datu’s words will ring true as you ascent the mountain, where praying mantis, various insects and other fauna could be found. The latest survey in 2003 showed no less than 129 animal species dwelling in Kalatungan. The first part of the trail is open and like that of Madjaas, would consume three hours of trekking. Then the forest line is breached, after which the long trek continues, taking 8 hours to reach the summit campsite and involving a scenic “summit ridge” trail. Then, the traverse proceeds south to the town of, starting off with Mt. Makaupao, a component peak of the Kalatungan Range. It will take a dozen more hours to reach the town proper, and climbers (indeed, survivors) of the Kalatungan climb will tell you that the final leg of the trail is called “Dead Nails’ Trail” and for good reason. Indeed, the technical challenges as well as cultural and natural wonders of Kalatungan are a powerful invitation to climbers who must not miss Kalatungan in their list of must-climbs in Mindanao. Logistics. Arrangements in climbing Mt. Kalatungan are made with the PASU of the Kalatungan Range Natural Park, Mr. Vergilino Alima, +639282523558. His office will issue a permit, climbing certificate, and will also coordinate regarding guides and the Talaandig tribe. Ten is the ideal maximum number since there are limited guides and the tribe also wants to regulate number of persons climbing. As of March 2009 P300/day is the guide fee while P200/day is the porterage fee. Transportation. From CDO’s Agora Terminal you can take a Malaybalay-bound bus, then from Malaybalay, take a bus/jeep to Kibanggay (P60) then finally take a habal-habal to the jumpoff. There is also, if you’re lucky, a direct trip from Agora Terminal to Kibanggay until 4 PM daily. Tribal sacrifice. It is Talaandig custom for the following items to be brought for the ritual sacrifice: a live chicken, some local wine, white and red cloth, and rice. Others. There is minimal cellphone signal coverage in the mountain, especially at the North Face (Brgy. Miarayon-summit). Two watersources are present: one in Camp 1 en route to the summit and the other at the Pangatucan campsite itself. Heading up the summit of Mt. Kalatungan, with the valley between the main peak and Mt. Wiji at the background. 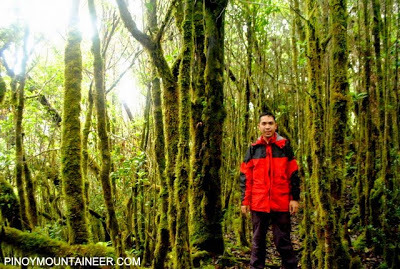 The mossy forests of Kalatungan rank among the most beautiful in Mindanao, along with Mt. Talomo, Mt. Lumot, and Mt. Dulang-Dulang. 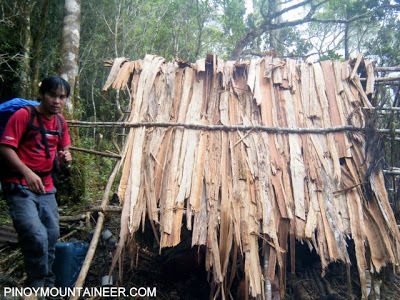 Hunters’ makeshift hut along the trail. Deer and wild boar continue to be hunted in the mountain by the indigenous peoples. Excellent views of the highland trees, at par with the surrounding high mountains. 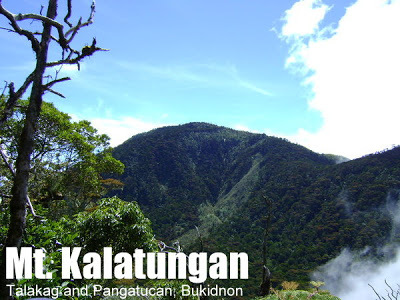 Kalatungan did not become identified as one of the Top 10 highest in the Philippines until recently, and although there are proposed elevations of Kalatungan as high as 2870 or 2880 masl, these are still unconfirmed. However, it is possible that Kalatungan would be upgraded as the 5th highest on the next revision of the “Highest Mountains in the Philippines” list. Pictures and information courtesy of Jan Pambid and Kat Ocol, as well as Mijan Pizarro. Many thanks! 15 Comments on "Mt. 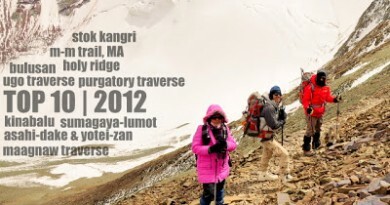 Kalatungan/Traverse (2,880+)"
planning on Mt. Kalatungan climb 2nd week of december..meron po interested?…pls text me…09296188143…tnx..or baka may mga ng.organize na po baka pde ako sumama..tnx agen..
We will be climbing mt kalatungan in Dec 2013..If theres anyone interested to take on the challenge, or who wants to take their hiking experience to the next level, Kindly text me at 09184595910..And also, this Dec 2012, the great talomo-apo traverse and the mighty kitanglad to dulang dulang traverse.. So if your tired in climbing the nearby mountains in batangas,cavite and rizal..txt me..
Just came from mt. kalatungan it was a priceless experience…just wanted to thank tourism officials specially sir renato sabado (tourism officer) for a very warm welcome and to those people who help us on our journey. Brgy. Kagawad Eric Salido & Bantay Lasang Manobo Piyo Tunhay maraming salamat po!!! Mabuhay kayo!! !